Consistent with her own unorthodox and provocative concepts, LA-Based Artist Rebecca Heinicke is looking to inspire emotional equality through her complex Abstract and Expressionist paintings. Rebecca's creative process involves capturing raw feelings that are integrated within a specific emotion or subject and deconstructing them down to the core values. This process enables her to encapsulate the micro-expressions that construct visual emotions and reconfigure them in such a way that the viewer is able to feel the texture of the emotions and delve deep into a sense of empathy for the unfamiliar. 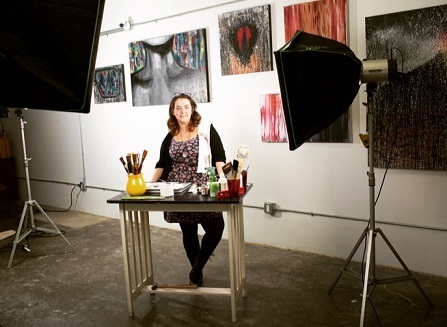 Rebecca is currently a featured artist at The Art of Monteque and BeverlyHillsART. She is exhibiting locally in Oxnard, doing private showings at the Tuesday Gallery, and recently featured at the Splore Launch Event in Venice, California at the G2 Gallery. Rebecca's work is currently on solo display for JUNE/JULY 2016 at Bee's Boba & Juicery in Canoga Park, as well as at the Canoga Park Artwalk that occurs every third Thursday. Her Artwalk display is located inside and in front of Bee's Boba & Juicery. Featured from top left to bottom center: "Just Focus", "Body of Loss", "Brain on Anxiety", "Avoidance"